You searched for "Sailoz Mukherjea"
Abanindranath Tagore, Gobhardhan Ash, Nandalal Bose, Ramkinkar Baij, Somnath Hore, Jamini Roy and Sailoz Mukherjea are among the prominent artists from ...with printmaking. Somnath Hore looked at art as a tool to express his angst against a skewed socio-political system. 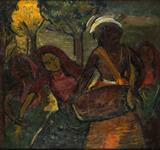 Works by Sailoz Mukherjea are also on view.